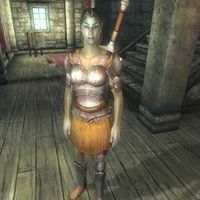 Tadrose Helas, a Dunmer smith, is a Journeyman of the Bravil Fighters Guild. She sells weapons and armor, provides repair services, and offers basic training in Armorer, but only to members of the Fighters Guild. Being the resident smith of the Bravil chapter can be hard work, but Tadrose still manages to find time to barter, repair and train. She sleeps on the 2nd floor of the guildhall and wakes up every morning at 6am. The first two hours of the day is spent on the ground floor, being too busy to do anything but personal doings. At 8am, she relaxes and begins to offer her various services to customers. At 10am, she will participate in an exhausting sparring session with fellow guildmember Vincent Galien. Despite the presence of a training area in the basement, the two of them will spar on the ground floor. They will keep going until 4pm, when she will wander restlessly around, waiting for dinnertime to come. She will stop offering her services at 6pm, when she finally sits down at the table and consumes a two-hour dinner. From 8pm until her bedtime at midnight, she will once again be too busy to offer any services. She wields an iron claymore and has a set of iron boots, iron cuirass and iron greaves equipped. She only carries a small amount of gold. She will introduce herself with "How do you do? I'm Tadrose Helas, Smith of the Bravil Fighters Guild chapter and trainer for Armorers" and explain how she keeps busy when asked about the town: "There's a lot of adventuring action from here south to Blackwood, and everyone comes to me with their gear." Tadrose doesn't seem to be exaggerating either. The people of Bravil often comment on how busy she is: "I understand Tadrose Helas has more jobs than she knows what to do with. She's very eager to help out her guild", "Tadrose Helas teaches smithing at the Fighters Guild. Well, when she has the time", "She's always busy, that's for sure. I have heard she's a good teacher, though", "She probably takes on more than she should. Between smithing and training, she's always hard at work", "Is there a busier smith in Tamriel than Tadrose Helas?" and "I've heard Tadrose Helas does excellent work. Perhaps that's why she's always so busy." It is unclear how she gets so busy, however, as the townsfolk bemoan her availability: "Tadrose is a fine smith, but I understand she only offers services to other Fighters Guild members."